Post summary: Examples how to mock static methods in JUnit tests with PowerMock. In Mock JUnit tests with Mockito example post, I have shown how and why to use Mockito java mocking framework to create good unit tests. There are several things that Mockito is not supporting, but one of them is mocking of static methods. It is not that common to encounter such situation is real life, but the moment you encounter it Mockito is not able to solve the task. This is where PowerMock comes to the rescue. PowerMock is a framework that extends other mock libraries giving them more powerful capabilities. PowerMock uses a custom classloader and bytecode manipulation to enable mocking of static methods, constructors, final classes and methods, private methods, removal of static initializers and more. Nota bene: it is good code design practice to make utility classes final and with a private constructor. Nota bene: there is a possibility of version mismatch between PowerMock and Mockito. I’ve received: java.lang.NoSuchMethodError: org.mockito.mock.MockCreationSettings.isUsingConstructor()Z exception when using PowerMock 1.6.5 with Mockito 1.9.5, so I had to upgrade to Mockito 1.10.19. Final JUnit test class is shown below. The code in tests verifies logic in LocatorService, if a point is given then new point is returned by adding random to its X and Y coordinates. By removing the random element with mocking code can be tested with specific values. PowerMock is a powerful addition to standard mocking libraries as Mockito. Using it has some specifics, but once you understand them it is easy and fun to use it. Keep in mind that if you encounter a need to use PowerMock that can mean that code under test is not well designed. In my experience, it is possible to have very good unit tests with more than 85% coverage without any PowerMock usage. Still, there are some exceptional cases where PowerMock can be put in operation. 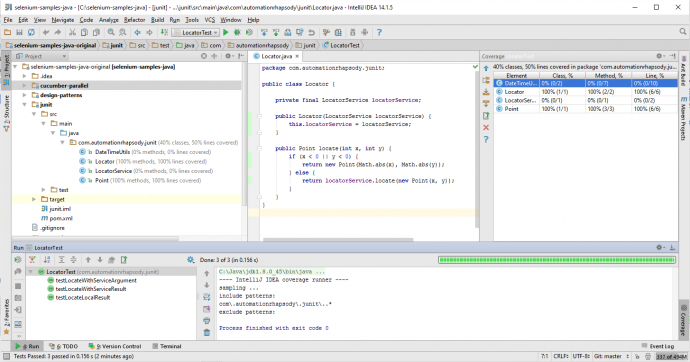 Post summary: How to do data-driven testing with JUnit parameterized tests. In Mock JUnit tests with Mockito example post, I have introduced Mockito and showed how to use for proper unit testing. In current post I will show how to improve test coverage by adding more scenarios. One solution is to copy and then paste single unit test and change input and expected output values, but this is a failure-prone approach. A smarter approach is needed – data-driven testing. The term from Wikipedia is: Data-driven testing (DDT) is a term used in the testing of computer software to describe testing done using a table of conditions directly as test inputs and verifiable outputs as well as the process where test environment settings and control are not hard-coded. This exactly what is needed to improve test coverage – test with different scenarios and different input data without hard-coding the scenario itself, but just feeding different input and expected output data to it. Nota bene: Every JUnit test (class annotated with @Test) is be executed with each row of the test data set. If you have 3 tests and 12 data rows this will result in 36 tests. The full example can be found in LocatorParameterizedTest.java class. Standard JUnit data provider is not very flexible. Define the data set is used for the whole test class, thus every test method in this class will be run with each of dataset rows. If you have 4 rows and 3 test methods then this will result in 12 tests being run. TestNG provides much better data provider where a dataset is defined and can be applied to individual test method only. More details can be found in TestNG data provider page. 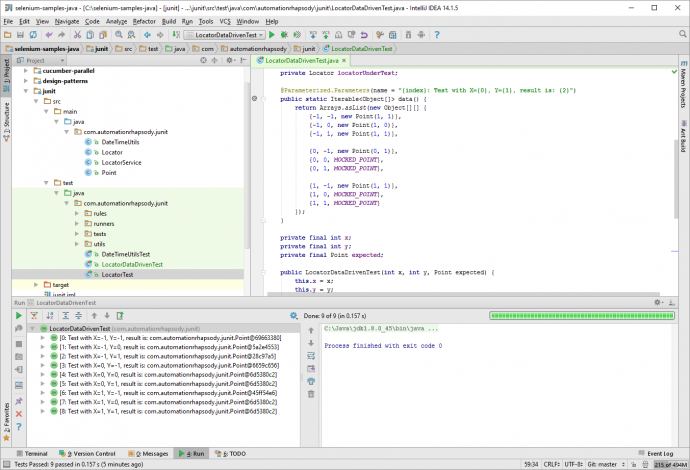 This data provider is available for JUnit by external Java library called junit-dataprovider. More details how to use this data provider can be found in Data driven testing with JUnit and Gradle post. Data-driven testing is very powerful instrument. With current post, I showed how easy it is to do it with JUnit as well as what alternatives are available. Post summary: How to assert mock method is called with the specific object as an argument in case no equals() method is implemented on argument object. The code above verifies that mock’s geoLocate() method was called with argument object with coordinates (1, 1). Internally Mockito uses Point class’s equals() method to compare object that has been passed to the method as an argument with object configured as expected in verify() method. If equals() is not overridden then java.lang.Object’s equals() is used which compares only the references, i.e. if both variables point to one and the same object in heap. In the current example, Point class has no equals() method implemented. When providing expected a new object is created, references are not one and the same, so Mockito will fail the verification. In order to make verification works simplest solution is to implement equals() method in Point class. Personally, I’m not a big fan of changing production code for sake of testing. Maybe there is a valid reason for a developer to have designed current class in such manner. A more realistic scenario is that Point class comes from some external library which there is no control over, so overriding equals() method is not possible at all. In examples above is shown how to implement or change equals() method behavior for a specific class in unit tests so that Mockito can verify object from this class is provided as an argument for mock’s method call. Post summary: Why mocking is needed in unit testing and how to do it with Mockito. By definition, unit testing is a process in which the smallest testable parts of an application, called units, are individually and independently tested for proper operation. Smallest testable unit in Java is a method. Public methods are the only one exposed to outside world, so only they are subject to unit testing. Unit tests focus on a particular piece of code that needs to be exercised. In most of the cases, this code relies on external dependencies. Those dependencies have to be controlled, so only code under test is exercised. Removing dependencies is done with a test double. Test doubles are objects that look and behave like their release-intended counterparts but are actually simplified versions of them which reduce the complexity and facilitate testing. Test doubles are fakes, stubs, and mocks. Mockito is the most famous mocking framework for Java. It provides all mocking features needed for proper unit testing, except mocking of static methods. Static methods can be mocked with PowerMock. It is a Mockito’s wrapper that provides same API plus static method mocking and other features. In PowerMock examples and why better not to use them post, I have shown how to use PowerMock and its features. The example above is pretty simple. If we pass point with some negative coordinates method locate() returns point with positive coordinates. If coordinates are positive then search via LocatorService is done. This class represents some external API that our code is calling. Since there is no control over this API and internal structure is not know it should be mocked in the unit tests. As stated above unit tests are focused on a specific piece of code, a unit. If locator class is called with a point with coordinates (5, 5) then new point with coordinates (50, 50) is returned. If mock is called with a point with coordinates (1, 1) then point with (11, 11) is returned. In any other cases, null is returned by default. Nota bene: in order to work properly object used to call the mocked method (Point is the current example) should have properly implemented equals() method otherwise java.lang.Object‘s equals() method is used, which just compared the references. Examples above will not work, as Point doesn’t have equals() method properly overridden. Call to invocationOnMock.getArguments() returns array with arguments that mock’s geoLocate() method was called with. In the current example, it is only one argument from type Point, so it is cast and saved to new Point object inside caller variable. If coordinates are (5, 5) then new point with coordinates (50, 50) are returned. If coordinates on input are (1, 1) then new point (11, 11) is returned. In all other cases, null is returned. The example above verifies that mock’s geoLocate() method was called with a specific point with coordinates (1, 1). If it is not important which object is passed to the method then any(Point.class) can be used. Nota bene: the example above will not work as there is no equals() method implemented on point class, so Mockito is using java.lang.Object’s equals() method by default that compares only the references. Point class is intentionally left without equals method to demonstrate how such situations can be solved. How to solve this obstacle is shown in Assert Mockito mock method arguments if no equals() method implemented post. Next step is to improve test coverage by adding more unit tests. Copy/paste is not an option, so in post Data driven testing with JUnit parameterized tests I have described how to make data-driven tests in JUnit. Mocking is mandatory when developing unit tests. Mockito is a convenient mocking library for Java. It is possible to control what mock returns if called with whatever value or if called with a specific value. Mockito allows verification on which of mock’s methods has been called and how many times.